LONDON, UK —FM Global, one of the world’s largest business property insurers, announced today that it ended 2013 with consolidated gross premium in force of US$5.6 billion, a 2.7 percent increase compared to 2012, and policyholder surplus grew by 22.9 percent to US$9.7 billion. Net income was US$1.02 billion, up 32 percent over the prior year, and the mutual insurance company posted a combined ratio of 77.7 percent. FM Global’s client retention rate was 95 percent, approximately a one percent increase over 2012 and significantly higher than industry averages. Seventy-six percent of property insurance policies were delivered on or before the effective date of the contract, and 97 percent were delivered within 40 days. FM Global announced clients would collectively receive an estimated US$435 million in membership credit when they renew their policies between June 30, 2013 and June 29, 2014. Following this credit, FM Global clients will have benefited from nearly US$2.1 billion in total premium reduction since 2001. 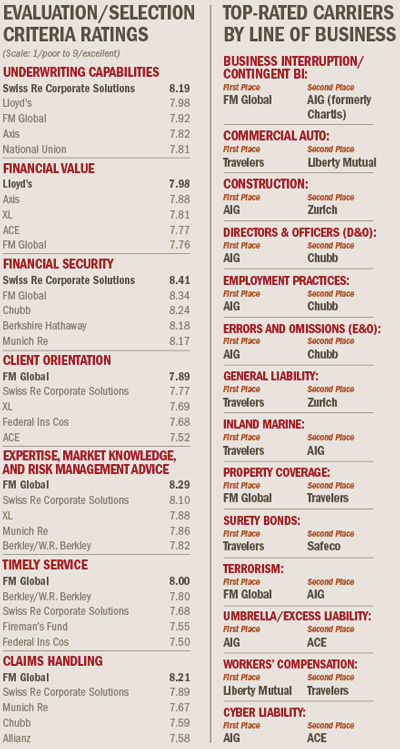 FM Global was named the best commercial property insurer overall and for service and expertise in Business Insurance magazine’s 2013 Buyers Choice Awards. The company was rated the top choice in nine categories in Property Casualty 360°—National Underwriter magazine’s 2013 Risk Manager Choice Awards. Both A.M. Best and Fitch reaffirmed FM Global’s ratings at A+ and AA, respectively, which remain unchanged since 2007. “Looking ahead to 2014, which marks our 179th year in business, FM Global will continue to focus on developing and delivering proven, cost-effective solutions to make our policyholders’ organisations more resilient to business interruption anywhere in the world, while providing stable risk-transfer solutions that are compliant with local regulatory requirements,” said Subramaniam.